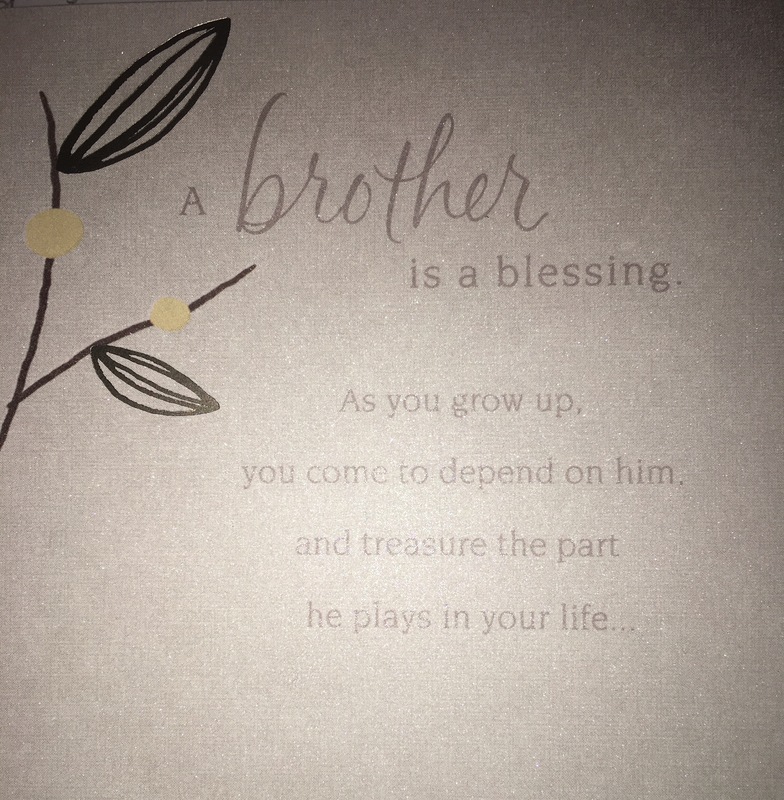 I wish you were the brother described on the front of this card. I wish I could have depended on you. I wish I could say “I love you” without it feeling so complicated. You were my big brother. Seven years older, taller, and stronger than me. I looked up to you. You were the only friend I had. You were the only person that knew my reality, because you were living part of it, too. I wonder how hard it was for you to stand by and watch me get hurt. You were there all those nights she came into our bedroom. You knew what she was doing to me in the shower. But you had to close yourself off from it all, you couldn’t help. I understood that. You were just a child, too. I grew up and watched you struggle. I watched you get beaten, just like I had been beaten. I watched you slowly self-destruct. I heard you crying in your room at night. I was crying, too. I watched you make yourself bleed, and I bled, too. Those scars on your body that you still bear, I know how you got them. I have those same scars, too. I still remember the night you locked yourself in the bathroom. You banged your head against the wall until you were bloodied and bruised. You couldn’t even speak. All you could do was cry. Hurt and cry. I understood, because that was the language that I spoke, too. We didn’t know any better. We weren’t allowed to have voices. We shared the same silence. We shared the same hurt. We shared the same pain. I understood you. I thought you understood me, too. But then you turned against me. You became her adjutant. You pretended to be my brother only to report everything back to her. You helped her terrorize me. You stood by her side as she treated me like a prisoner. Why? You are her son, but you were also my big brother. I needed you. You could have protected me, but you didn’t. I wanted so badly to help you. I felt horrible leaving you behind. I was weighed down with guilt for over a year. Did you ever feel any of those things when you chose to work against me? You never reached out. You never once showed me that you cared. You told lies about me just like she did, when you could have just said nothing at all. I used to envy you. I wondered why she loved you so much. Then when I got older, I realized that’s not love. It’s abuse, too. I hope one day, for your sake, you will see that she doesn’t love you. What she’s done to you, what she continues to do to you — it’s not love. It never was. Part of me fears that it’s too late for you. You’ve become so much a part of her that you don’t even know who you are without her, and who you could be. There’s a great big world out there waiting for you to see. I hope you see it one day. We have chosen different paths. I chose to be nothing like her. I chose to be free. But you’ve chosen to follow in her footsteps. You’ve chosen to stay. I’m grieving your loss, because I’ve realized you will never be the brother I needed you to be. I held out hope that you would make the right choice, but you haven’t. I don’t blame you, but I hope you understand why I have to let you go. This is such a beautiful letter. It’s so heartbreaking as well. I am so sorry.